ORLANDO, FL--(Marketwired - Apr 23, 2015) - Missing teeth can affect the ability to properly chew and speak, not to mention have a significant impact on the appearance of one's smile. Dr. Ronald J. Trevisani, an oral surgeon and implant dentist in Orlando and the Maitland area, has devoted his career to helping patients replace missing teeth with results that both look and feel natural. In fact, Dr. Trevisani recently launched a new website devoted to one of the most popular forms of missing teeth replacement -- dental implants -- that offers people considering their options a unique educational resource explaining the many types of dental implants offered at his practice and how these advanced treatments have transformed the field of restorative dentistry. The new site for Dr. Trevisani's practice, Lifetime Teeth Today, has been built using a responsive dental website design. This means that the website can be easily viewed and navigated on desktop computers, laptops, tablets, and smartphones without sacrificing content or other elements that help viewers access important information about procedures they are considering. The site offers a detailed virtual tour of the practice, information on dental implant treatments for single and multiple teeth as well as laser oral surgery and other options, and biographies on members of the dental team, including Dr. Trevisani and Dr. Mohammed Zaman. Lifetime Teeth Today's new site is also equipped with pages describing its onsite dental laboratory, information on the advanced Prettau® Zirconia Dental Implant Bridge, a before-and-after dental implant photo gallery, and an in-depth video on the home page taking viewers through one patient's journey. 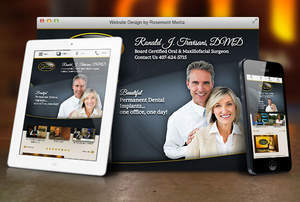 The site was developed in collaboration with Rosemont Media, a dental marketing company based in San Diego that creates custom websites for an array of healthcare fields. Dr. Trevisani hopes Lifetime Teeth Today's responsive new website will serve as a comprehensive source of information for people looking for denture alternatives and procedures designed to provide results that function like natural teeth and give them a new reason to smile. Dr. Ronald J. Trevisani is board-certified in Oral and Maxillofacial Surgery. He earned his dental degree from the SUNY Buffalo School of Dental Medicine, and was trained in Oral and Maxillofacial Surgery at the University of Florida Health Science Center. Dr. Trevisani is a member of the American Association of Oral and Maxillofacial Surgery, the American Dental Association, the American College of Oral and Maxillofacial Surgery, and many other organizations. Dr. Trevisani has been a practicing oral surgeon since 1996. He is available for interview upon request.